Evie's Closet prim skirts move so well. The skirts flow with weight around your legs so that it's a pleasure to wear the long ones -- especially if your AO makes you wriggle and spin. I caught a retro vibe from the line of the top, which put me in mind of a young Elizabeth Taylor, so I added Ingenue skin and hair for a slightly different spin on this ethereal gown. My avatar is walking in the water of Whimsy Winx's grotto at Oubliette, adorned with jewelry from Balderdash and a pair of pretty fairy anklets from Studio Sidhe -- you can see these more closely over here. Balderdash is one of my favorite sims to photograph in, and the lovely jewelry, clothing and architectural pieces only add to the ambiance. 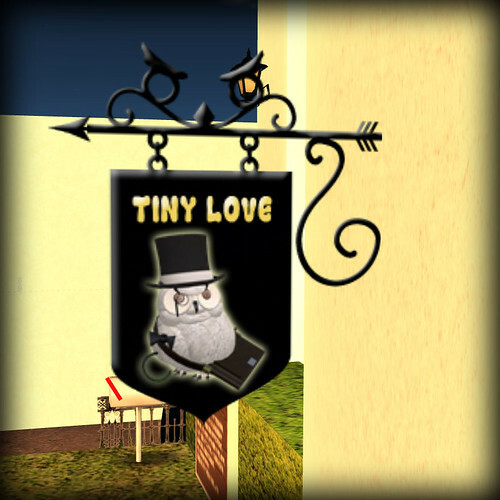 I had the strangest feeling of loneliness tonight, right up until I poked around plurk and found people dancing, exploding buildings, and generally kicking up a ruckus. Sometimes the solitude is just what I desire, and sometimes I want to get out and do my single-girl shimmy in the middle of some couple danceballs. It's funny, but I've had this on my mind of late. I wonder if the ORLY owl would partner with me? 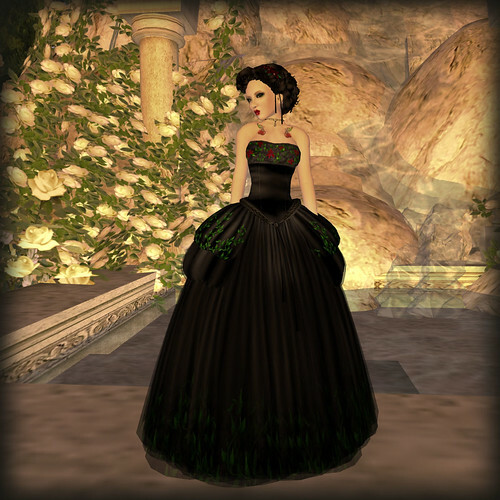 Surf Couture has come out with a new, lovely dress -- and new skins as well. I'm wearing a selection of these beach-ready skins, complete with cute imperfections, like the sun-splotches on the cheeks. The retro prettiness is perfect for a jaunt around the /artilleri/ beach. ***Hair: Tiny Bird Bella - Chestnut. Not yet out; poke Autumn Hykova for more info. Today's pose pictures are of the new Joy poses from Lazy Places. 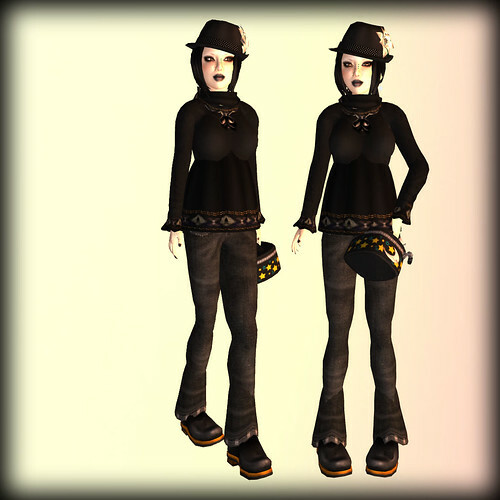 They're playful and energetic and perfect for goofing about with pals -- something that, um, I should be reminded to do occasionally in Second Life. The outfit that I'm wearing is the result of sorting inventory in the Utsuku City camp chairs this morning. 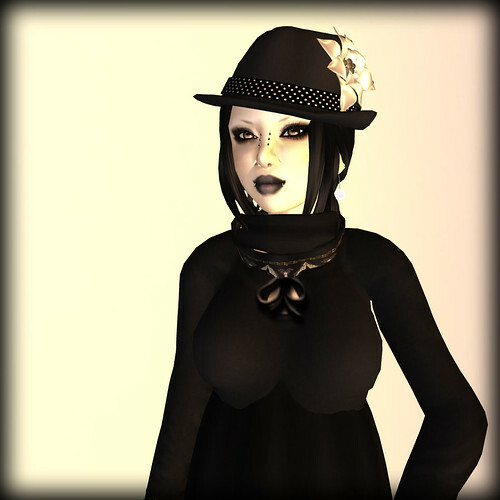 Shockingly (or not), my avatar ended up looking a hella lot like I do IRL, with the exception of the red pumps. I'd be wearing pink converse instead, and a slightly more plain hat. In the top photo, if you squint, you can see that I'm wearing a neat new necklace from Kunstkammer. It has a cephalopod on it, staring cutely out from the pendant. It's being eaten by the patterned shirt from Kurotsubaki -- totally Spring and garden-wear, which I felt encouraged to buy after reading Elusyve's post over here (she's so pretteh!). Hah, I realized how vastly different this nerdly post is from the sultriness of my last one. Poor readers, having to bend to my whims. At least I'm consistently all over the place? Within a short time Scheherazade was conducted by her father to the palace, and was admitted to the presence of the sultan. They were no sooner alone than the sultan ordered her to take off her veil. He was charmed with her beauty; but perceiving her tears, he demanded the cause of them. Instead of returning any answer, Scheherazade addressed these words to the sultan: "Will your majesty permit me to indulge in a story?" There's something about putting on silks that instantly creates a fantasy. Ellantha and I hit the Solange 50% off sale yesterday, and after that we romped about in our new garb. The Sultan set for boys comes complete with shoes and a turban and a cloak (not shown), and Ellantha's pretty wisp of nothing enhances her skin and prim footed sandals. The sale is definitely worth a visit, even for first-time silk buyers like myself (and I know what I'm wearing for Halloween this year). Fiend for a sloppy fro, who seen the evil Coiffio? 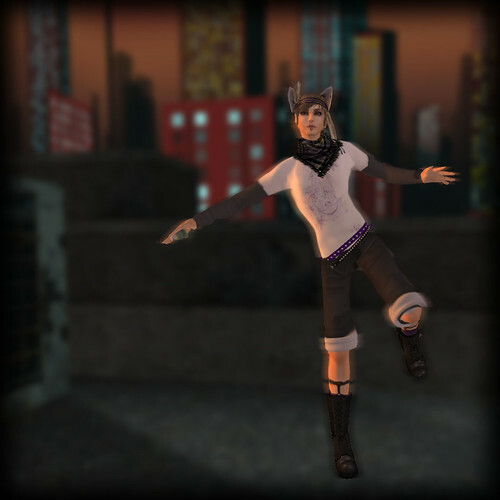 ***Ears: By Wynx Whiplash, retextured and modded. ***Inhaler: Inhaler from Asthma HUD by Fade. Yesterday, instead of Surprise Buttsecks, I was poked by Tomo of Little Boy Blue and given some Surprise Jewelry. The surprise is that he's picking members of the Little Boy Blue group for inspiration (there might also be a Yuki eyepatch based on Yukio Ida), and this set of jewelry is named Achariya. The rest of my outfit combines a white tailsuit from Black Canary with bloomers from Sn@tch and hair from Historic Heroines (the pretty new Miss Derbyfield locks). Photo backdrops are in MiaSnow's rebuilt Hwang. I think I look like Mourna. :D Have lovely days, everyone! I'm going to go off and mutter my precious over my orange-toned necklace, nao. Bonus pretty picture! 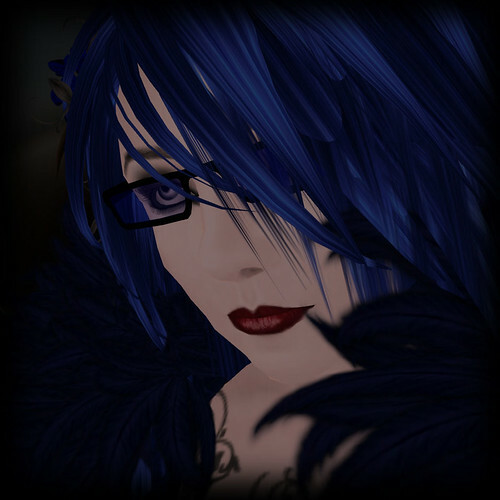 hyasynth in glasses and a boa. ~Maleeka~ designs sent me a lovely choli to review. I put it on, stared at myself, and realized that I needed more ... bunny. Bunny rocks this outfit, however. 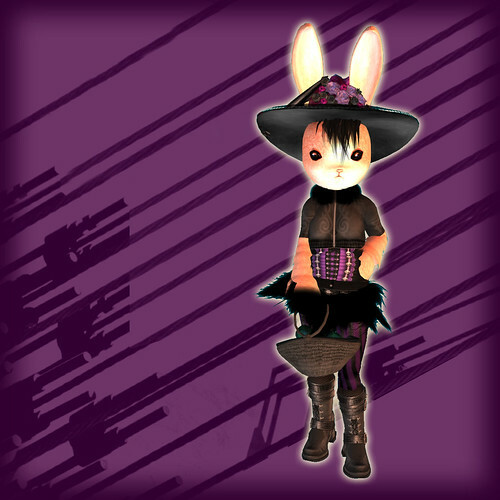 I like the saucy cut of the shirt and the flow of the prim skirt, and how it accents bunny's fur. 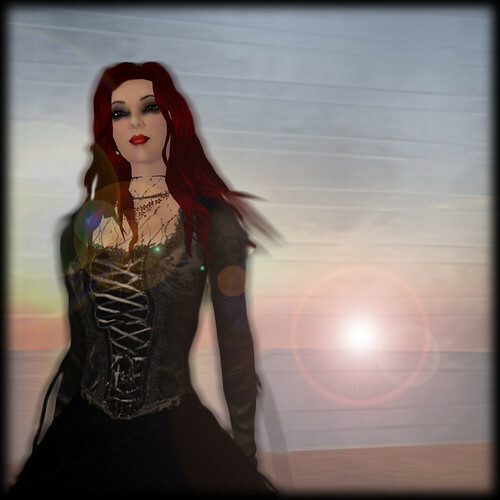 I went to the sim of Black Taj to photograph, following a lead from the gorgeous Strawberry's flickr stream. Black Taj is quite a build, and it's connected by a bridge to White Taj. There are couple walk poseballs because the Taj Mahal is all about romance. Bunny didn't mind being alone, however, despite the bobble-headed stares from the couples walking by. What, never seen a bunny in a choli before? And I heard, as it were, the noise of thunder. Or disappear into the potter's ground.